Bored of mulled wine? Over eggnog? You’re not alone. The UK’s favourite spirit brands have teamed up with food and drink taste innovators, Smith & Sinclair, to give Christmas feasting a make-over. The visionaries have created wild & wonderful festive cocktails to accompany your turkey and trimmings, inspired by research that’s unearthed the nation’s most-loved festive flavours. The nation is turning its back on traditional Christmas drinks in a quest for something more stirring; only 1 in 10 of the UK still enjoy conventional classics like eggnog. 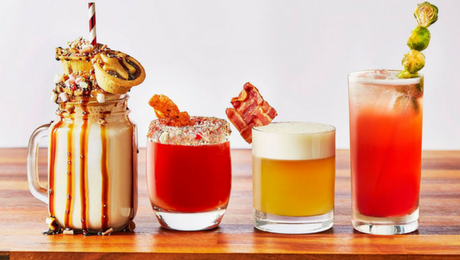 Alongside Gordon’s, Smirnoff, Johnnie Walker and Captain Morgan, Smith & Sinclair have created a flight of Christmas cocktails that hero festive ingredients you won’t expect to find in your Christmas tipples. What better way to kick off the season than with these #FestiveSpirits . With over half the UK experimenting with food and drink at Christmas and 7 in 10 (70.98%) of us choosing to splash more cash on it during the festive season, these unique serves are set to inspire the nation to go that extra mile - ‘tis the season to be jolly after all. Unsurprisingly, over half the UK are look forward to for those moreish pigs in blankets the most this Christmas. We’ve paired this festive favourite with Johnnie Walker Red Label to create the Johnnie Walker Wrapped in Blanket. A classic whisky sour with a smoky bacon twist to tantalise the taste buds. Coming out top is roast meat, with 68% of the UK claiming it as their favourite Christmas food. Like a match made in heaven, we’ve created the Smirnoff Bloody Mary with all the Trimmings. Perfect to make with friends, this sharing cocktail spices up an old classic served with a stuffing rim and turkey crisp – worth a shot! Fizz:Gordon’s gin and a cranberry syrup, topped with Prosecco and garnished with caramelized Brussels sprouts. It’s a fresh take on this Christmas time necessity that you won’t want to miss. When it comes to dessert, there’s a clear winner with the mince pie coming out trumps. The Captain’s Mince Pie Freakshake is set to be the go-to for those with a sweet tooth. What better way to eat your mince pie than piercing a straw in it and slurping a Captain Morgan ice cream milkshake through it? These twists on the Christmas dinner are easily replicated for friends and family, with simple recipes below. Select bars and restaurants throughout the UK will also be serving the Cocktails of Christmas including London’s M Restaurant, Ben’s Canteen, BIRD and Cardiff-based restaurant ETC.